CryptoDefense: Keys pair stored on disk! This little detail slipped through their fingers... TOO LATE! 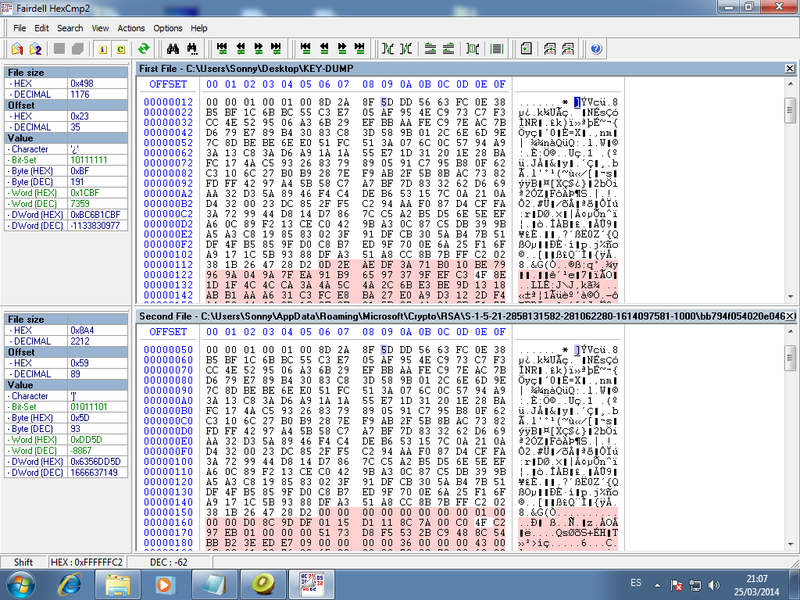 HEXCMP highlights in red the differences whereas identical bytes remain white. TCP/IP dumped data is identical to the key found on Disk. The private key is encrypted via DPAPI (Data Protection API). There are many RSA keys in that folder though, but you can still find them by sorting these files by date. If you don't remember the date you got infected, see your screenshot at the crook's webpage or search for the oldest HOW_DECRYPT.TXT file in your system. I'll update this blog soon! I've got some nice small files, the key, and some timestamps... how should I get them to you? Not seeing nearly enough thanks being given to you for your hard work and efforts to remedy this douchebags handiwork. Excellent work man, and good luck with your efforts! I greatly appreciate all of your hard work, and if I can help in my limited way, please let me know. Alright, guys. This is a tough one: However, there's no reason to claim it's impossible to decrypt victims data. These idiots always let something slip through their fingers. Their servers might be found and keys restored to their respective victims. Errors might be found in their code, their key encryption scheme may have some weakness, etc. Let's just let the experts find a way out. By the way, if you want to temporarily protect your PC from this malware, you may do this. This article is technically accurate and it can be applied to rudimentary RSA implementations that only use time retrieval functions as seed as demonstrated by CS Students from Virginia University. Do NOT use somebody else's decryption program! The reason why each key is unique and why you can't use somebody else's decryption program is because this ransomware randomly generates the keys for each victim. If there was a unique private key for everyone, there would be no need to panic! You infected the wrong fool! Welcome to the "Decrypt Service"
Your files got encrypted by a RANSOMWARE!